We have received many inquires related to the unseasonably low lake levels and offer this explanation. The Devils Lake Water Improvement District has been conducting an erosion study to determine if and how the lake level impacts erosion on properties surrounding Devils Lake. In order to facilitate the study the dam has been left out until completion of the fieldwork. The work was scheduled to begin June 14, 2011 and last one week. The Devils Lake Water Improvement District holds a Recreational Water Use Right on Devils Lake. The water impoundment right allows the District to store additional water in the lake between April 15 and October 15. The level of the impoundment has been a hotly debated topic in the communnity over the past two years. The DLWID board resolved last year to exercise the maximum impoundment right of 9.53′; the current lake level is at 8.9′ approximately 7 1/2″ lower than the target level. We are hopeful that the dam will be constructed in the coming week. We have inspected the site and found that the vertical members are all in place. Therefore all that would be required is the placement of the horizontal elements which should be able to be accomplished in short order. At that point we can hope for a period of rain to restore the lake level. November brought a couple of unusually high tidal events washing the mighty Pacific and a portion of the wayside beach into the mouth of the D-River. Sand was deposited well beyond the Highway 101 bridge completing shutting down flow from the lake to the ocean. This month’s DLWID Manager report provides a description of what to occured. The D River became clogged with sand by high seas on October 24. Lake level was about 9.5 feet. On October 29th we received the last of the bids for dredging, and thus we used the lowest bid to dredge the D River on Monday Nov 1. The reason for waiting was that Kyllos had started a project sand blasting and repainting their I beams, which could have been greatly impacted by a reopened channel. The lake was not very high at that time. 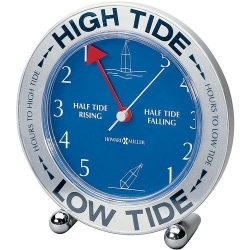 We did though receive a great deal more rain than was predicted over the weekend, and thus the lake level did rise sharply causing suitable alarm by many around the lake. The Monday dredging though predictably did not last long as ocean swells clogged the River by early Tuesday morning. On Wednesday we dredge again with the lake reaching its peak at 11.2’. The river has been running wide and clear since. 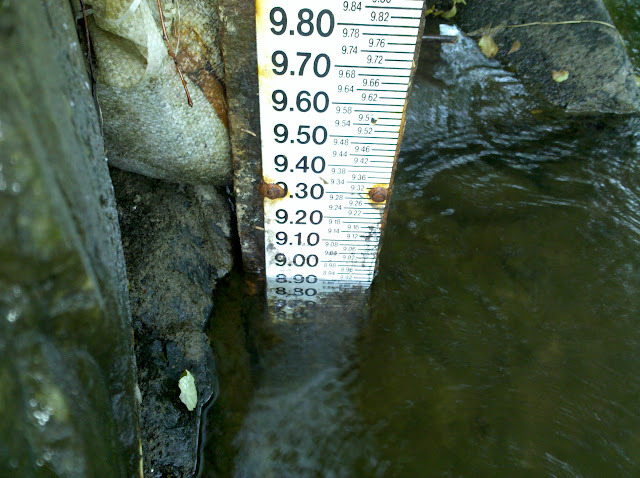 As of 4 pm Friday the lake level was reportedly at 10.2′. Much of this was captured by our Lake Manager by short videos and posted on the Districts Facebook Page. Some of the interesting posts included; 31 Foot Seas Takes Its Toll, D-River Down But Not Out, D-River 2011-11-02, D-River 2011-11-03, D-River Tubing, and Coho Salmon in the D River. This is the first year that the DLWID has defined a method to comply with the requirements of their water impoundment permit and recent rain events have added a new level of complexity. This month’s DLWID Manager report provides a description of what to expect. recorded the first day. In response the Lake Contractor pulled 2 north boards on 9-17-10 and pulled 4 boards north to south on 9-19-10. Overtime this appears to have compensated for the heavy rains as the most recent value sits very near the theoretic value. 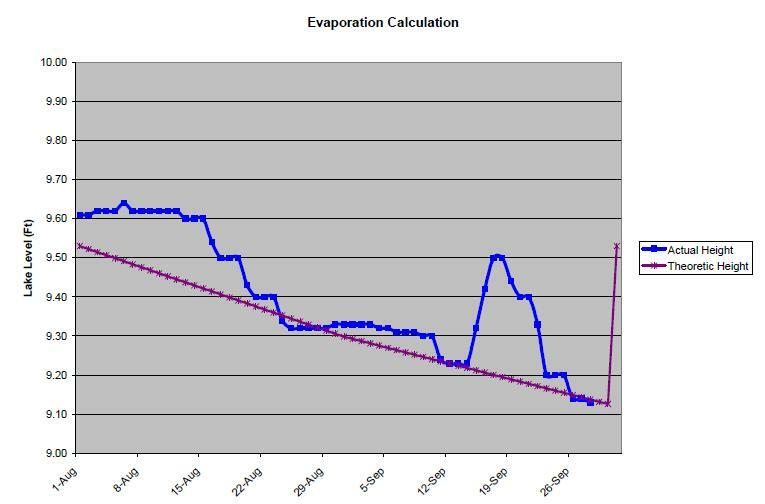 This is the first year that the DLWID has defined a method to comply with the requirements of their water impoundment permit that will result in the lake level dropping by approximately .40” from August 1st through October 1st. This month’s DLWID Manager report provides a description of what to expect. The lake has been manually dropped in the month of August by the Lake Contractor and will continue to be dropped through the month of September. This is being done in an effort to comply with the conditions of our permit that state that inflow and outflow must be equal during this time of the year. 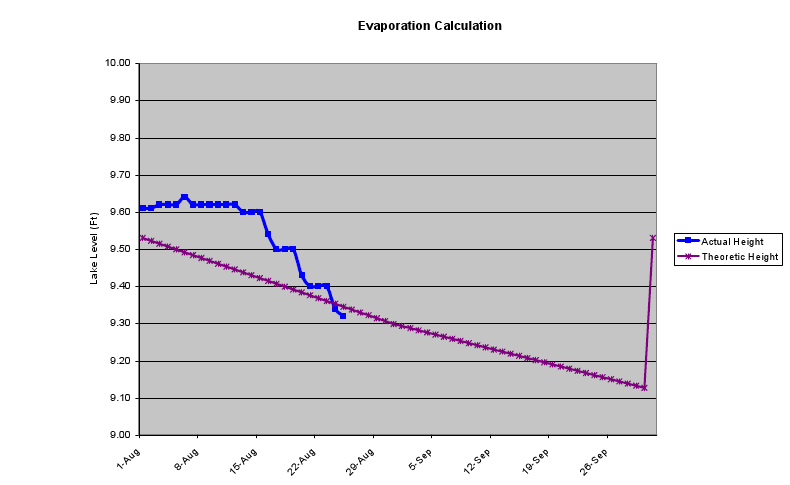 Effectively no additional water can be impounded in August and September, and in fact a slight decline in the lake height needs to be afforded to account for evaporation. This decline is on the order of 2/3” a week in August and a ½” a week in September.